A dial and oscillating weight cut from a disc of aventurine now graces the Grande Seconde Tourbillon, Jaquet Droz’s legendary timepiece. 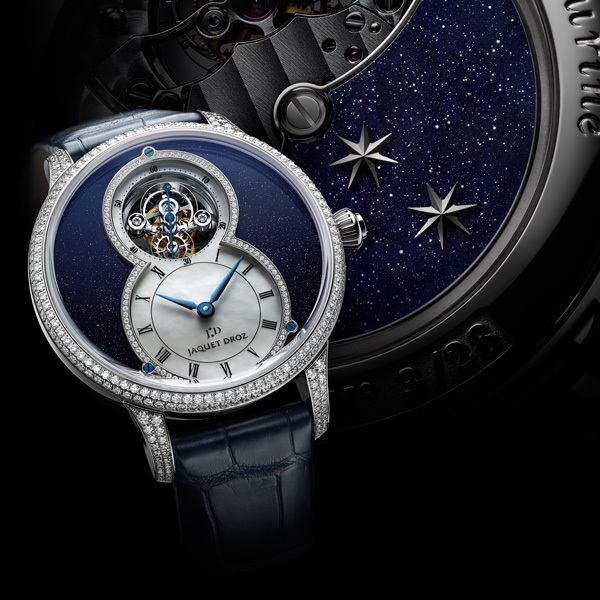 For the very first time, the spellbinding display of its tourbillon is enhanced by the poetic, mineral glitter of a star-strewn night sky. 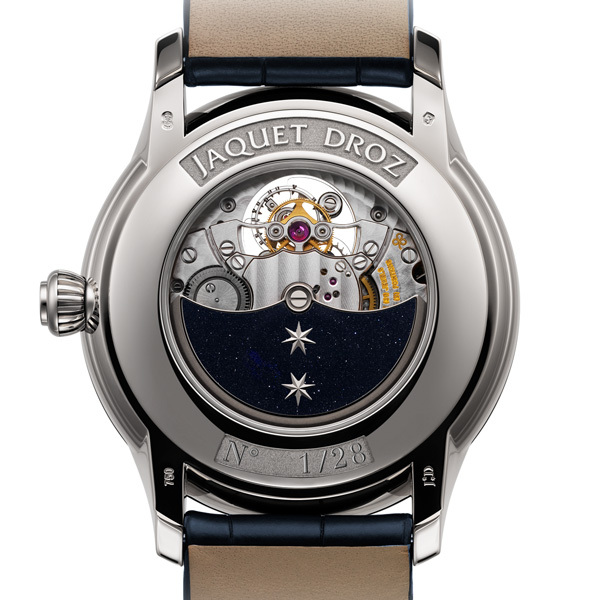 Reinterpretation and respect: two watchwords governed the creation of this latest version of the Grande Seconde Tourbillon, in which the entire range of skills and knowledge held by Jaquet Droz has found its fullest expression. 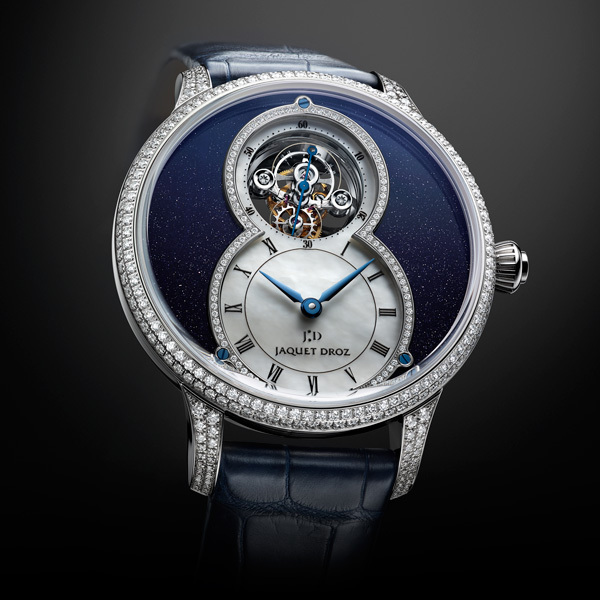 Within the white gold case, redesigned to a new diameter of 39 mm, a fusion takes place between the technical mastery involved in producing watchmaking complications and the high aesthetic standards and virtuosity required in jewelry making – features of the Brand since its inception in the Age of Enlightenment. The Grande Seconde Tourbillon Aventurine is a jewelry watch; its bezel, lugs and the contours of the famous figure 8 motifs are set with 382 brilliant cut diamonds. The aventurine, with its scattering of tiny gleaming shards, is made yet more splendid by the fire in the precious stones, conjuring up a veritable night sky in miniature, echoed by the blued steel hands. A delicate touch of mother-of-pearl is introduced as the ultimate refinement and plays with the effects of light and the reflections of the exquisite gems. The hours and minutes dial in white mother-of-pearl has exceptional readability, while the tourbillon, protected in its sapphire crystal frame, reveals the complex architecture of watchmaking with hypnotic appeal. 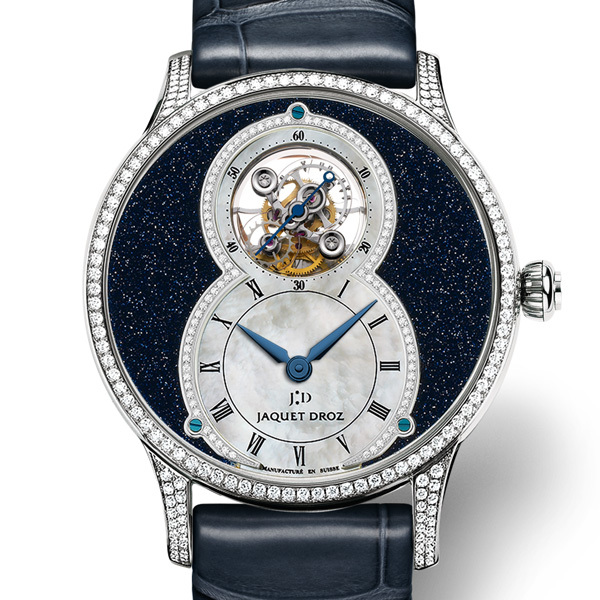 It is a dazzling piece of theater that the owner of this timepiece can enjoy again when turning the watch over to see, on its back, a custom-made piece of aventurine set into the gold oscillating weight and affixed with the two gold stars that form the signature of Jaquet Droz. For the first time Jaquet Droz has paired the tourbillon with a mineral dial and has placed this particular complication in a 39 mm case. The self winding mechanism is fitted with a power reserve of 7 days. Only 28 of these exclusive, bewitching timepieces are available.